Miss Douglas, We are EXTREMELY Proud of You! Posted By:@AVGJOhanna | At:9:43 AM Be the first to comment! You know what they say about opinions? Yeah everybody has one. Well now that Miss Douglas has completed her Olympic performances, I will share my opinion about my pride in her performance and my disgust for what should NOT have become a national conversation. First I will address the latter. Everyone has an opinion. Social media has made that undeniably clear. A person may be entitled to their opinion, however, we should be smart enough to know when our opinions actually matter...when we should speak up versus when we should shut up. That is another unfortunate consequence of social media. People can ramble on and on about the most inconsequential stuff to a point that it actually makes an impact, usually a negative impact. Clearly some people do not exercise enough forethought before posting stuff. Some people want to be provocative and instigate mess and now they have a platform to do just that. At the lowest level, those posting negative comments about Miss Douglas should have realized that their thoughts about her do not matter and at the very least, it could hurt her feelings. Taking the responsibility up a level, the comments should not have been dignified with a response. I understand that folks were trying to smack down the negativity and school the folks that were talking foolishly. All that did though was open the conversation up which ultimately detracted from the honorable attention that she should have continuously received. Who were the people making the comments? Do you know who they are? The media outlets referred to them as "one user said..." I mean really? I'd almost get it if a celebrity criticized her. But to dignify the comments of a bunch of no-names is just inexcusable. We have a 16-year old young woman that pretty much came out of anonymity and made history. All of the good attention can be a distraction. Why throw in mess that everyone agrees is just that MESS? Those defending her honor actually made things worse. She still had two more competitions left after winning the all-around title. I won't act like I know if this impacted her last two performances. Elite athletes have the keen skill of laser focus. Until she states otherwise, I will believe that she just had a couple of bad days performing acrobatics that only a handful of people on this earth are actually capable of doing. Now my opinion about her performance. I did not watch the US Olympic Trials, but had seen clips of her performance. So I knew that I wanted to watch her compete once the games started. After I saw her compete in the team qualifying round, I thought she could actually take the all-around. It was just this gut feeling that I had. I knew she was going to win. I hated the time difference but I actually did not mind the spoiler alert. I knew what time she was competing. After guessing about what time the competition would be finished, I went online and sure enough her historic win was the headline. I wanted to scream. I wanted to tell my colleagues, but I knew they were avoiding any news outlet and wanted to see the competition with fresh eyes. So I had to keep my excitement to myself. Instead of waiting for the primetime coverage for her next two contests, I downloaded the Live Extra app and set reminders so I could watch it live. 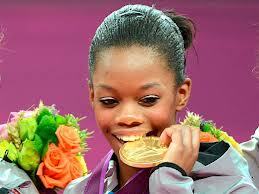 I was just imagining her coming in and winning every event and coming home with four gold medals. Can you imagine being 16 years old coming to your first Olympics, making history and just sweeping the competition? I wanted her to have the Midas touch. 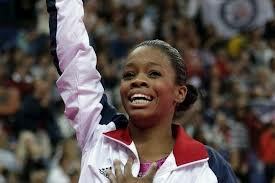 I watched her individual contests on the uneven bars and the balance beam. We all know the outcome. I will not dwell on that. Her worst day in competition is better than most people's best days. In short my opinion of her performance is nothing but sheer pride. Miss Douglas, I am EXTREMELY proud. You rocked the world. I am so glad that you reaped the rewards of your hard work and sacrifice. I am sure that I speak for millions, even billions, of others when I say that we wish only the best for you. Fantastic job and much love to you, Miss Douglas! !